With guests and new parishioners joining us each week, it’s important that they be able to get to know us. 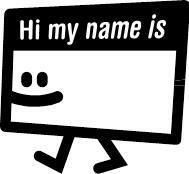 Please remember to wear your name tag (available in the Narthex). Thanks!